Honey-roasted apricots are the perfect sticky, sweet topping for a summer tart. This fruity dessert has been given a lighter makeover with a no-fuss creamy yogurt filling and easy crunchy filo pastry base, so you can certainly treat yourself to an extra slice! Preheat the oven to gas 4, 180°C, fan 160°C. 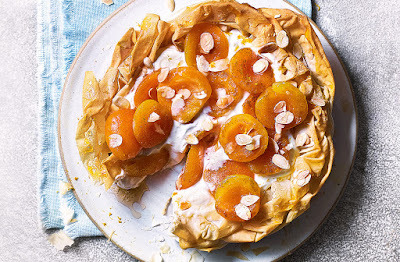 Put the apricot halves, cut-side up, in an ovenproof dish. Drizzle with the orange juice and 1 tbsp of the honey. Roast for 30 mins, basting halfway through, until the apricots are soft but still hold their shape. Meanwhile, spray each sheet of filo with oil. Layer into a shallow 20cm round cake tin, overlapping, to cover the base and sides. Brush with the warmed apricot jam and bake for 20-25 mins until crisp and golden. Remove and leave to cool completely. Mix the yogurt with the remaining honey and half the orange zest. Spoon into the tart case, then pile the baked apricots on top with any juices. Top with the toasted almonds, remaining orange zest and a drizzle more honey. Serve immediately.